How can a traveler easily carry and study a 2,711 page book? If that book is the Talmud, the wise traveler obtains a ShasPod, an Apple iPod packed with audio commentary on this massive compendium of Jewish oral law. 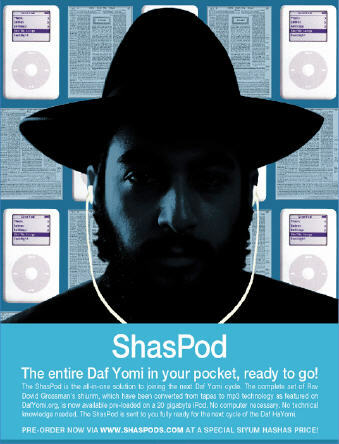 The ShasPod is a twenty-gigabyte iPod loaded with 2,711 shiurim, one for each page of the Talmud. A shiur is a brief (30-60 minute) discussion by a religious teacher. Each shiur is in English mixed with Aramaic (the language of the Talmud) and some hebrew phrases. The compact iPod is not only more compact than the paper-based version of the Talmud, it is a lot smaller than the typical audio version, which runs to about 2,000 tape cassettes. A ShasPod can be purchased for $399. Although the ShasPod cannot be used by Orthodox Jews on the Sabbath (religious laws prohibit the operation of electrical equipment), you could still listen to your ShasPod on Friday morning and Saturday night, thus listening to your daily Talmud lecture while honoring the Sabbath. "It's a very old Orange Catholic Bible made for space travelers. Not a filmbook, but actually printed on filament paper. It has its own magnifier and electrostatic charge system." He picked it up, demonstrated. "The book is held closed by the charge, which forces against spring-locked covers. You press the edge -- thus, and the pages you've selected repel each other and the book opens." Read more at 2,000 Talmud Tapes or One Loaded iPod or go to ShasPod.com; listen to a sample shiur.